Master props builder Zander Brandt specialises in taking weapons normally found only in video games and bringing them kicking and screaming into the real world. We've featured his work here a few times before, with Team Fortress 2 and Mass Effect weapons, and it's the latter series he's returned to with this awesome M-25 Hornet SMG. Built from wood but weathered to look like it's been to Earth and back on Shepard's back, it's based on actual dimensions provided by BioWare artist Brian Sum (who we've had on Fine Art previously), and in a neat touch the magazine actually slides in and out. Even neater? 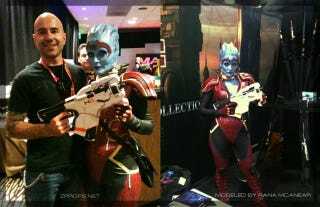 The gun made the trek to Comic-Con, where it was photographed in-character by Rana McAnear, the actress who plays Samara in the game. You can see more work-in-progress shots at the link below.